How can the humanitarian sector in Pakistan build more effective systems for humanitarian action? And how do we need to work together to achieve it? These were the questions we attempted to answer during Start Network’s ‘The Future of Humanitarian Action in Pakistan’ conference, held in July in Islamabad, with the support of ACTED and the Humanitarian Leadership Academy. More than 130 participants from national and international civil society organisations, donors, UN agencies and government officials came together at this event to explore what an ideal future might look like and how we might reorient ourselves to get there. The participants drew on their knowledge and experience to put forward ideas for what an ideal humanitarian future would look like. Out of those discussions emerged a vision for a humanitarian sector which in 10 years’ time, by 2027 has very different capabilities and operates on very different incentives, than the ones we see today. At the heart of this, there was a need to further develop a guiding vision so the sector can reorient itself to get there. We want to see a future where everyone is able to contribute to a humanitarian sector that truly makes communities safer and more resilient to disasters. Without this, we will continually compete and stay stagnant ins a system that is unable to cope or adequately assist the communities we seek to serve. The conference provided a platform for the kind of forward-looking dialogue that can produce meaningful change.The energy of so many people coming together under a shared, audacious mission to transform the system for the better was certainly felt by all. ‘The conference presented me with a rare and valuable opportunity to put aside my thoughts on today’s humanitarian action and look at how Trócaire, together with our humanitarian partners in the Start Network, can future proof a response which is agile, appropriate and empowering for crisis affected communities in Pakistan’ John O’ Brien, Country Director- Pakistan, Trócaire. 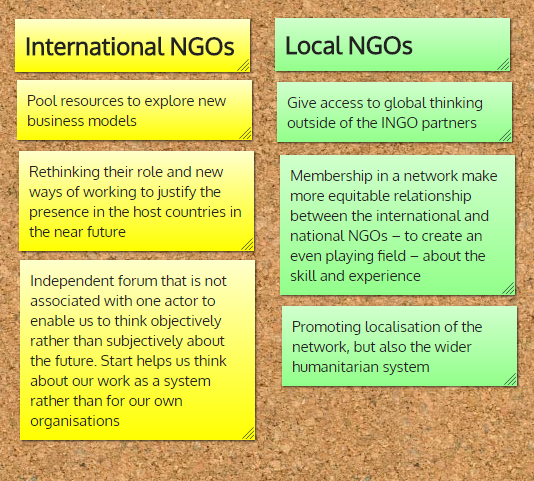 The day after the conference, member and national NGOs met again and developed a road map to realise this future. Participants discussed what the value of the Start Network might be in Pakistan from the perspective of international organisations and local/national organisations. They were given post-it notes to represent the views of either INGO or NNGOs in articulating the value. The group recommended the formation of a “Realisation Team” to bring together actors to explore the setup of a Start Network hub. The membership and key stakeholders have drafted a Terms of Reference and will be voting on representation by the end of August. We know there is a lot to do to make this happen, but the network we are part of is energised to put in the work needed.